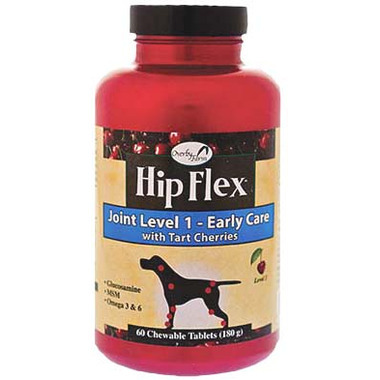 Overby Farm Hip Flex Tablets are formulated for Level 1 Joint Care in your dog! These tablets are designed as a preventative maintenance supplement to help maintain normal healthy cartilage and joint function. Contains Glucosamine and MSM for added joint support. Active Ingredient: Glucosamine HCL (Shellfish source) (500 mg), Methylsulfonylmethane (MSM) (250 mg), Tart Cherry and Dark Berry Proprietary Blend (100 mg), Linolenic Acid Omega 3 (Flaxseed) (12000 mg), and Linolenic Acid Omega 6 (Flaxseed) (2600 mg.
Inactive Ingredients: Citric Acid, Dicalcium Phosphate, Dried Whey, Malt, Maltodextrins, Microcrystalline Cellulose, Magnesium Stearate, Natural Flavoring, Rosemary Extract, Silica Aerogel and Stearic Acid. For use with Dogs only! Always follow the instructions attached to the label of this product!